Don Mariano Bus Line cancelled and confiscated – for good. 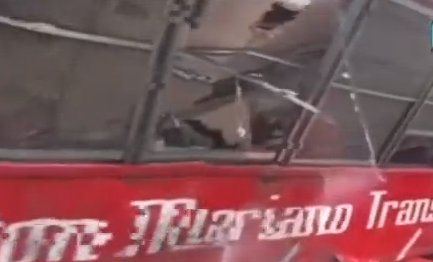 Notorious for over speeding and making the passengers feel like in a race track on fly-overs, Don Mariano Bus Line’s 78 unit is permanently cancelled and confiscated, as announced by the LTFRB chairman Winston Ginez. The last incident happened on December 16, 2013 at the Skyway on the South Luzon Expressway ( SLEx ) falling to the ground at 9.6 meters below, killing 18 and 16 others hitting a van. According to Supt. Elizabeth Velasquez, police Highway Patrol Group ( HPG ), is the worst accident happened in Metro Manila. 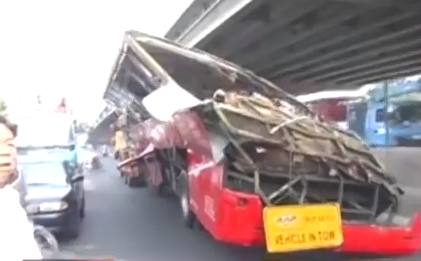 Passengers like Pepe Padilla, 54, before it dropped and loosing control, the bus is swerving, at an interview of The Inquirer.net. Even the senate mandated a drug test to all behind the wheels. Published at the Official Gazette, Republic Act No. 10586 or AN ACT PENALIZING PERSONS DRIVING UNDER THE INFLUENCE OF ALCOHOL, DANGEROUS DRUGS, AND SIMILAR SUBSTANCES, AND FOR OTHER PURPOSES, which President Benigno Aquino III signed, for mandatory testing to all drivers. Accidents way back October 2009; January and November 2010; January and August 2011; July 4, 2012 at EDSA-Ortigas Flyover injuring eight people. A vow turned into tragedy. The director of the Manila Disaster Risk Reduction and Management Council [MDRRMC] Johnny Yu confirmed that a member of the Hijos del Nazareno, Renato Guryon, 44, died on the day of the procession in January 9, 2015 while managing a sea of devotees wanted to have the chance to wipe or touch the Black Nazarene’s feet. Seeking for healing, personal requests and good fortune was the main reason for this clamor to get close to the statue. Guryon and the group were securing the carriage since Thursday night which aggravated their fatigue. they were believed to be holy places where miracles happen and prayers were heard. 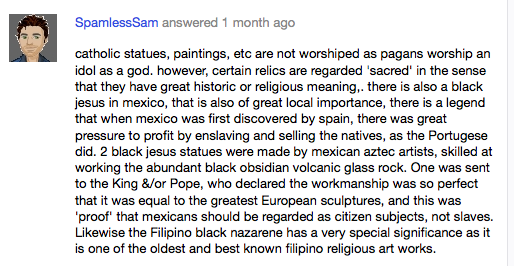 The parade of the Black Nazarene originally came from Mexico. A long been tradition that the Filipinos adopted. The color came about when the boat caught on fire that made the once white statue to a burnt one. Now, it is carried off by a gold carriage and the devotees wore maroon. This is held yearly at Quiapo, Manila. A belief that whosoever touch the Black Nazarene will be healed and devotees from different parts of the country and tourists alike rub and kissed the Nazarene. The lighting of candles, performing mass, changing of clothes, holding the Nazarene, novena, parade, taking off foot-wears and walking in knees are some of the rituals that majority of the devotees do in the anticipation of the actual parade. Devotees believed that it is the place that God showers his blessings in the church. But time passed that most attendees present in Quiapo came not to worship. 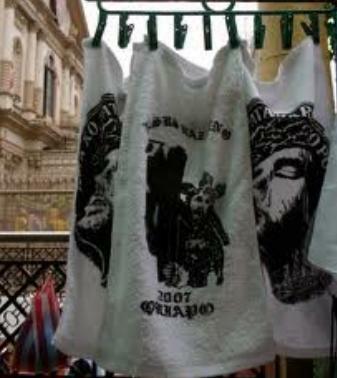 Many of them came to sell souvenir items. Small and big replicas of the Black Nazarene — made out of plastic, wood and stones. But the most common is the handkerchief which devotees rub to the feet and face believed to heal anything that touches it. Taking time to a “holy” event that vendors dug in to this occasion to produce some money and others for sentimental reason for the thousands of devotees gathered around the country. This festivity is held every 9th of January. The devotees joins the parade “barefoot” as a sign of humility. 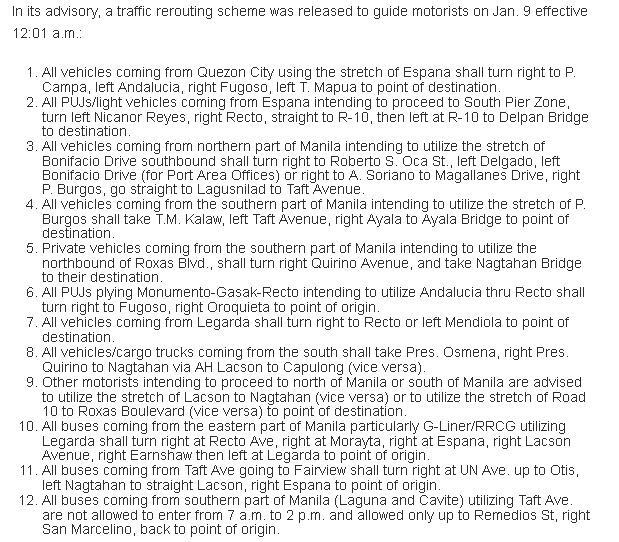 The Metro Manila Development Authority [MMDA] set a traffic rerouting scheme for the Friday’s procession. 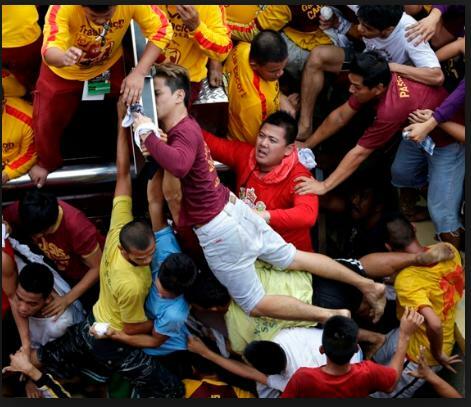 Although the government had set some rules and rerouting schemes, still people are injured and many are suffocated due to the massive crowd that circled the Black Nazarene just to get a hold and wipe off its feet. Dr. Eric Tayag, Health Assistant Secretary said that 1,686 patients had already been attended as of 6 p.m. and that does not include the hours after the parade. At the end of the day, it is us who make our life decisions. It’s just a matter of principle. What is right and what is just. What is clear and what is just absurd. Rev. Anton Pascual, Executive Director of Caritas Manila and head of the papal visit subcommittee on media relations said in an interview of the Asian Journal that the Black Nazarene feast is a dry-run for the up-coming papal visit of Pope Francis. “Yes, the Black Nazarene fiesta is a dress rehearsal for the papal visit, especially the culminating mass at Quirino Grandstand in Luneta, manila on January 18. It is just so sad that the feast that supposed to have healing miracles is also an event that caused another his life and to others, injuries. It had been long practiced but what does the Bible says in these occasions? 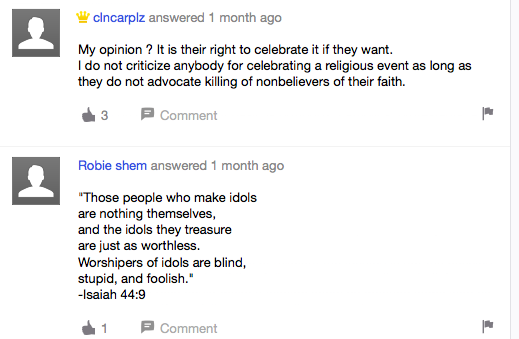 Totoo bang ang pagluhod sa mga larawang inanyuan o graven image ay paggalang lang daw at hindi pagsamba? Zambrano, Chiara. 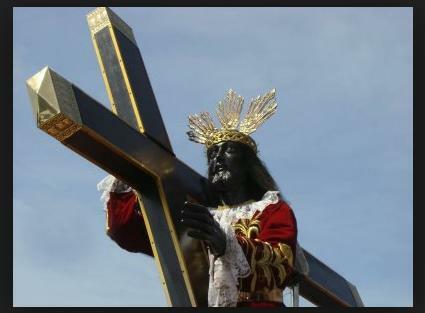 “Black Nazarene Devotion: Deep Faith or ‘idolatry’?” N.p., 8 Jan. 2014. Web. Ignacio, Clem. “Understanding the Devotion to the Black Nazarene.” Minor Basilica of the Black Nazarene. National Liturgical Congress, 12 Apr. 2012. Web. Tangi, Rocelle. “Dry Run for Papal visit.” Asian Journal. N.p., Jan. 2015. Web.